Do you have experience on Kilimanjaro you would like to share? If so email me and we can work on a posting of your experience. Ontario's Outdoor Activities. This blog will be devoted to Kilimanjaro related stuff including advice on hiking/climbing the mountain, as well as flora, fauna, and geology. Mount Meru and Mount Kenya are also fair game. An autoworker who loves the outdoors, has 3 grown daughters and 2 boys at home. Diamox is a drug taken by many as a preventative measure against AMS. There is considerable controversy over its effectiveness and whether or not it is for everyone. I am not going to wade into that discussion here. Myself and the two others I climbed with all took it and we all were successful but many climbing at the same time were successful without it. I have included links on various subjects including AMS and Diamox. The main side effect of Diamox is that it is a diuretic. You are constantly peeing, and drinking and peeing again. This is one thing during the day but something else entirely at night. 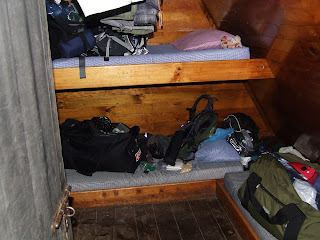 We climbed using the Marangu route so we had cabins each night. See the photo below. Most of the cabins have two rooms each having four bunks. Every bit of building material on the mountain is carried up by foot, so needless to say not much is wasted. The cabins are A frame styled and they have four bunks. I pity anyone who is over six feet tall as the bunks are tight. When all four of you are in a cabin and all your gear is in there is no extra room. In fact walking from the bunk to the door is a challenge. Even more of a challenge in the dark! There were three of us, so each night we had a roommate that was a stranger to us. Every night it was someone different. It is one thing to wake up a good friend in the night as you are going out to the bathroom, quite another to disturb a total stranger. Anyways this is adapted almost verbatim from my journal on the night at Horombo hut. Slept like a baby last night with the exception of having to get up to go to the washroom three times, a side effect of Diamox. Going pee in the night is quite a comical operation, especially if you are in the top bunk. Generally you delay getting up until you are just about desperate. When there are three others in your cabin you try very quietly to unzip your nylon sleeping bag. Then in the pitch black you feel around to find the clothes that you so neatly placed somewhere the night before. When you find said clothing you attempt to put it on quietly in a very cramped space in the dark. After having accomplished that quite nicely, you reach for your glasses on the shelf over your bunk. In the process you knock everything off the shelf, find your glasses, put them on, find your headlamp and put it on your head, and find your roll of toilet paper. Now the part about being on the upper bunk comes into play. You then reach up and grab a hold of the rafter with both hands, hang from the rafter for a few seconds and then drop the six or eight inches to the cabin floor, landing awkwardly on someone’s boots and stumble making enough noise so that now everyone in the cabin is wide awake. At this point they all decide that they should go to the bathroom as well, so they turn on the headlamps and get dressed in the light and then we can find the latch on the cabin door and out we go!! Those of you who are thinking of going to Kili may find this a bit of an odd journal entry. Those who have been will find it quite apropos. As promised here are some links on altitude sickness, Diamox and mountain medicine. They will open in a new window.